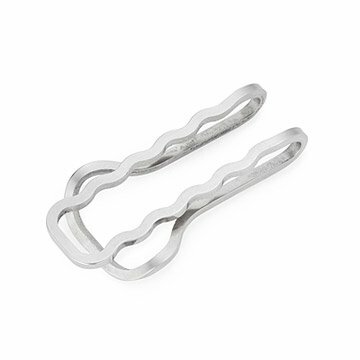 Keep your cash stylishly tidy with this industrial-inspired, solid stainless steel money clip. A distinctive gift for any guy with an eye for cool industrial design, this solid stainless steel money clip keeps your cash stylishly tidy. Its strong but slender frame takes its cues from utilitarian hardware, while the brushed finish adds a touch of luster. Designed by Hunter Craighill in Brooklyn; made in Ohio. Hunter Craighill designs elevated items meant for everyday use. After studying to be an architect, his career turned to graphic and product design. He spent several years working closely with historic American manufacturers on behalf of an outdoor lifestyle brand before partnering with a childhood friend, Steve Gavula. Their products encompass a wide range of materials and functions, unified by a design philosophy that marries efficiency and exploration. Their primary creative drivers are personal curiosity, industrial experimentation, and basic utility. They strive for honest and precise manufacturing, much of which occurs in their New York studio. It's their belief that a well designed product should be perfectly functional, and also tell a story about its creation and potential. Nice feel and look to it.